A mouthguard is a flexible appliance made out of plastic that is worn in athletic and recreational activities to protect teeth from trauma. To protect your mouth from injuries, the dental profession unanimously supports the use of mouthguards in a variety of sports activities. More than 200,000 injuries to the mouth and jaw occur each year. Anytime there is a strong chance for contact with other participants or hard surfaces, it is advisable to wear a mouthguard. 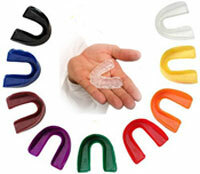 Players who participate in basketball, softball, wrestling, soccer, lacrosse, rugby, in-line skating, and martial arts as well as recreational sports such as skateboarding and bicycling should wear mouthguards while competing. A custom-made mouthguard by Dr. Drahota offers the best protection, fit and comfort level because it is made from a cast to fit your teeth. Call our office today for an appointment. The purpose of this Web site is to provide information and is not intended to be medical advice.